UCLA, 13-0 and ranked No. 2, represents the biggest surprise of the college basketball season. The Bruins’ odds to win the national championship were posted at 50-1 in early November. Every handicapper has experienced a bad week, and even the sharpest gamblers occasionally suffer through a losing season. 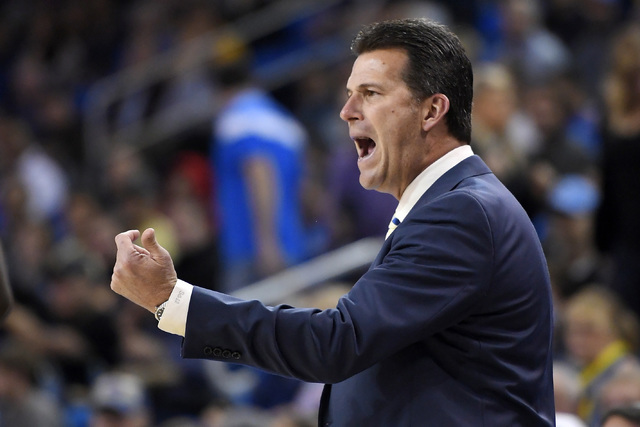 In that sense, Steve Alford serves as a reminder that everything can turn around quickly. Firing the coach — or trashing a handicapper — after a losing season is not always the answer. 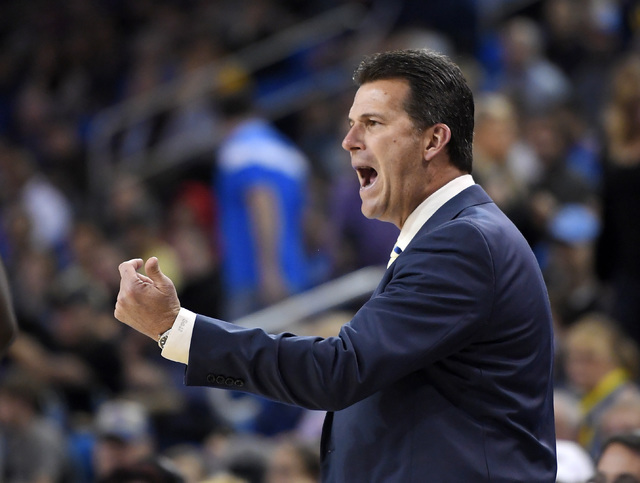 In March, Alford was UCLA’s beleaguered basketball coach. At the campus around the corner from Hollywood, he was almost as unpopular as Bill Cosby. But in December, the Bruins are unbeaten and Alford already has bounced back. The angry mob that once wanted him fired has quietly dispersed. UCLA, 13-0 and ranked No. 2, represents the biggest surprise of the college basketball season. The Bruins are probably the team bookmakers fear the most, too, because their odds to win the national championship floated as high as 100-1 over the summer. “We have the most liability on UCLA,” said Nick Bogdanovich, director of William Hill sports books, where the Bruins were posted at 50-1 odds in early November. The champion is likely emerging from a group of seven teams — Duke, Kansas, Kentucky, Louisville, North Carolina, UCLA and Villanova. Five of those teams have played a game in Las Vegas this season, with the Blue Devils and Jayhawks rolling into town this month to crush UNLV. 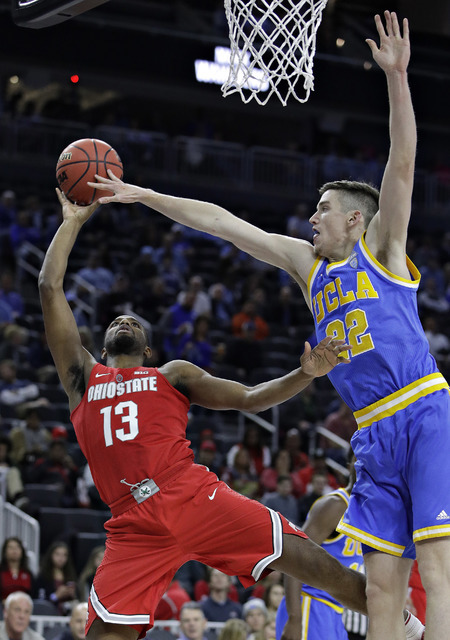 The Bruins’ resurgence, after they finished 15-17 last season, is due mostly to newcomers Lonzo Ball, a 6-foot-6-inch point guard, and TJ Leaf, a 6-10 forward. Alford is allowing his athletes to run and his shooters to fire away, and UCLA is scoring 95.8 points per game as a result. Most doubts about the Bruins were dispelled Dec. 3, when they ran over Kentucky in a 97-92 win in Lexington. It’s going to be tougher to knock out the Wildcats in March because John Calipari has plenty of time to coach up his NBA development team. “Like him or dislike him, Calipari has got the golden touch,” Bogdanovich said. It’s still fair to question UCLA’s defensive toughness, and there’s a chance Oregon will turn into a better team in Pac-12 Conference play. At 7-1 odds, the value is long gone on the Bruins, so anyone betting them now is late to the party. Looking for long shots with potential value on the futures board might be a futile search this season, but some candidates include Oregon (20-1), Indiana (30-1), Purdue (30-1), West Virginia (30-1) and Wisconsin (30-1). Hunting for a Final Four sleeper? Creighton (40-1) and Butler (100-1) are better bets than Gonzaga (20-1). Bogdanovich said he thinks “10 to 12 teams” at most could win the title. There is no obvious No. 1 team. The odds still say Duke (7-2). But with the NCAA Tournament three months away, there are at least six strong contenders capable of tripping up Grayson Allen and the Blue Devils. In early December, I made five college football bowl picks in this column. The first to go — San Diego State plus-3½ over Houston in the Las Vegas Bowl — was a winner to even my season record at 42-42-1. The other four, with lines posted at the time: Washington State (-6½) over Minnesota (Holiday Bowl); Stanford (-3) over North Carolina (Sun Bowl); Florida State (+7) over Michigan (Orange Bowl); Florida (-2½) over Iowa (Outback Bowl). Betting the bowls early is always a tricky proposition. Sometimes you get the best of the number, and sometimes not. The Washington State line has ballooned to 10½ because of suspensions and turmoil with the Gophers. The Stanford line has dropped to 2½ because Cardinal running back Christian McCaffrey is sitting out. Here are three additions for next week: Utah (-7) over Indiana (Foster Farms Bowl); Kansas State (+3) over Texas A&M (Texas Bowl); Oklahoma State (+3) over Colorado (Alamo Bowl). Las Vegas Review-Journal sports betting columnist Matt Youmans can be reached at myoumans@reviewjournal.com or 702-387-2907. He co-hosts “The Las Vegas Sportsline” weekdays at 2 p.m. on ESPN Radio (1100 AM). Follow @mattyoumans247 on Twitter.